I'm not the type of person who normally goes around barking orders, but I have to make an exception in this case. 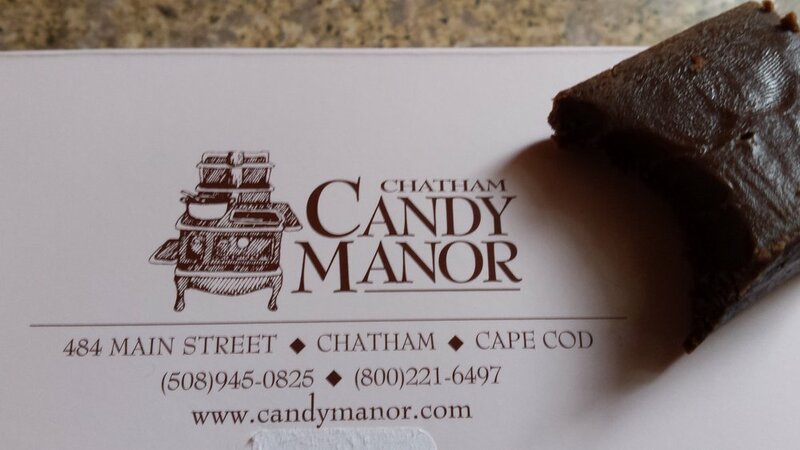 If you're a chocoholic like me, and you're anywhere near Chatham, Massachusetts, you must visit The Chatham Candy Manor. You simply must. For over 60 years, they've been proudly supplying tourists and locals alike with a decadent cornucopia of rich, hand-dipped chocolates lovingly made in small batches to ensure their freshness. Whether you're pining away for luscious, creamy truffles, famished for smooth, velvety fudge, or just HAVE to have chocolate in some way, shape or form, this store is a chocolate-lover's paradise. After one bite of their chocolate-raspberry fudge, I was in heaven, that's for sure! And don't even get me started on their buttery, crunchy toffee, their chocolate dipped dried apricots, or any of their other treats, or this blog will be longer than "War and Peace!" They're also happy to design the perfect chocolate favors for your wedding or other special occasions. But please, try to save some for your guests! You can also purchase their delicious assortment of chocolates online, so you can always be assured of having a full supply of chocolate handy in case of emergency (read: for any reason at all! ).